I finished the Justerini & Brooks annual Burgundy tasting on a high note with this Bonnes-Mares from Domaine Bruno Clair. The aromas spread themselves across a spectrum of ripe cherry and strawberry fruit with a touch of licorice and hazelnut. Rich, glorious, suave, mineral, fine, uplifting on the palate. Things to get excited about! Bigger tannins than many other 2016s, chewy, richer. 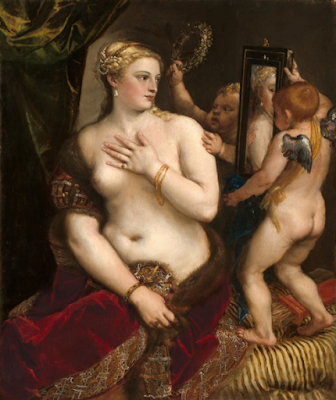 I chose this Titian painting entitled "Venus with a Mirror" to represent this wine in part because of the reference to "good mothers" in the name of the wine but primarily because this wine is priced at a level comparable to Old Master paintings and should be considered a sheer luxury. At £2,500 per case of 12 bottles in bond this is very much a wine for the richest 0.1% of society. No wonder Venus covers her breast in modesty! If 2017 prices are the same as 2016 then growers and merchants can no longer hide behind the fig leaf of a bad frost. We would be in a whole new phase of Burgundy prices where the best grands crus can only be afforded by very wealthy individuals. The test for this is how hard it is for the growers and merchants to sell the 2016s. If this en primeur campaign fails (and judging by the highly variable quality of the 2016s it certainly could fail despite the restricted volume of good wine) then 2017 prices which will be set in November this year at the Hospices will be 15% to 30% lower. Even as a lifelong Burgundy specialist I can't help but say that I will get far more pleasure from some well-made mature Riojas which cost a quarter of the price of Burgundy 2016 village wines or Rhône wines such as Cornas and Hermitage which are the same price but significantly more enjoyable. For those of you who are true Burgundy purists, older Burgundy vintages available at auction or from broking lists offer much better value than 2016. This is the first Burgundy vintage in 20 years where there is such a disconnect between price and quality. If you've got it flaunt it, dear.